TERA has been out worldwide on PC for over five years now. Boasting a player count of over 26 million, it is one of the world’s most popular games, period. The free-to-play MMORPG is finally being ported over to the PlayStation 4, and is close enough to this goal that the game was playable at Sony’s PlayStation Experience 2017 expo. We went hands-on with the game in its early state, and have our impressions ready for you below. During our demo, we ran through a brief scenario involving taking down a couple of basic enemies, followed by a boss encounter. There were three classes shown, out of the game’s 14 currently available. I played the Slayer class, a quick character able to dive in to combat, deal high damage, and then dodge out of the way. I was grouped with a ranged character and a tank. After learning the ropes of the control scheme with the smaller enemies, we were tasked with working together to take down the area’s boss. MMORPGs don’t usually translate very well to consoles, mostly because of the control scheme. Their user interfaces are also usually designed with a keyboard and mouse in mind, and translating all user input possibilities to a gamepad almost always involves major compromises. But TERA is a bit different. It’s an action-oriented MMORPG, to the point that its targeting system is more akin to a third-person action game than a regular RPG. What this means is that TERA is one MMORPG that had some built-in features that almost felt tailor-made for consoles. Targeting enemies, for instance, is performed by moving the reticle using the right analog stick, and then pressing down on that stick to lock-on. Combat involved pressing the face or shoulder buttons on the controller, and even included combos which, when performed properly, dealt large amounts of damage and had a relatively quick cooldown time. Holding L1 could also unlock the second row of moves, which helped to overcome the inherently limited number of buttons available on the controller to perform moves with. Honestly, it felt like playing an action RPG more than an MMORPG, which will only mean good things when TERA actually releases. The Unreal Engine 3 powered the demo we played. While this engine may be older with Unreal Engine 4 now having been out for a while, UE3 has optimizations that the team felt made it worthwhile to stay with for the time being. Regardless, TERA ran without any major hiccups during our demo, view distance was far, and the action was quick and full of plenty of special effects. It’ll be a fun game to play in 4K with its high-fantasy art work. In-game voice chat was supported and utilized during our demo, which is of course a crucial element to any MMORPG where teamwork is emphasized. The battle we played through was simple enough that not much voice chat or strategizing was needed, but of course things are unlikely to remain that simple when the game finally launches on console and much larger battles take place. 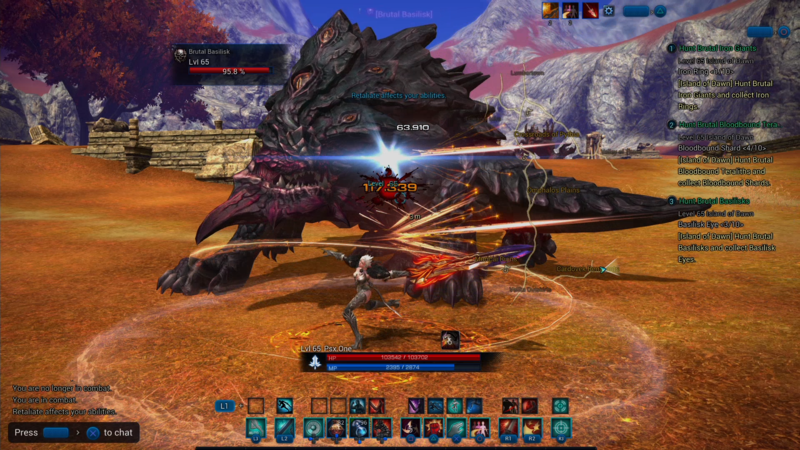 TERA is seemingly ready for its closeup with consoles. What was shown at PSX 2017 flowed nicely, and ran very well. Working as a team to take down massive enemies is rewarding, and the control scheme has been adapted to work just fine with a controller. Time will tell if developer Bluehole Studio and publisher En Masse Entertainment will find the same success on console as they have on PC, but the early prognosis is good. TERA PS4 preview conducted at PlayStation Experience 2017.